With Jamie T announcing a Liverpool date to support his new album, Getintothis‘ Craig MacDonald enters panic prevention mode. Cockney troubadour Jamie T has announced a special date at the vast surroundings of Liverpool Olympia on October 13. It comes as part of a UK tour in support of his latest album, Trick, which is due for release a month earlier on September 2. Jamie T isn’t the only performer gearing up for an Olympia date soon. The songwriter’s fourth album arrives little over two years since Jamie T made a welcome comeback with the tremendous Carry On The Grudge. Having well and truly kicked the Kazimier into gear with his summer 2014 antics with a warmup gig for that album’s tour, the rafters of the Olympia are sure to rattled when he returns. With new dark single Tinfoil Boy offering a glimmer of a record that has been hinted to link thematically into claustrophobic London summers, listeners can expect plenty more hooks worming their way from his new offering. The Wytches have been announced as the main support for the tour almost immediately after their Liverpool Psych Fest slot. Their new album All Your Happy Life will be released on Heavenly Recordings September 30. They will also be playing their own headline tour commencing in November. 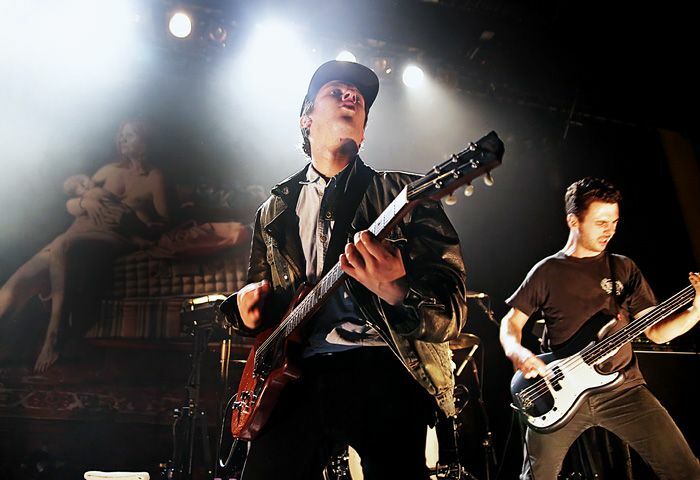 Getintothis’ have learnt that Jamie T’s gig scheduled for October 13 at the Liverpool Olympia has been cancelled as well as his Bournemouth show due to illness. Cancelled dates will be rescheduled and we’ll bring details of those as soon as we have them. Here’s the handwritten apology from Jamie.